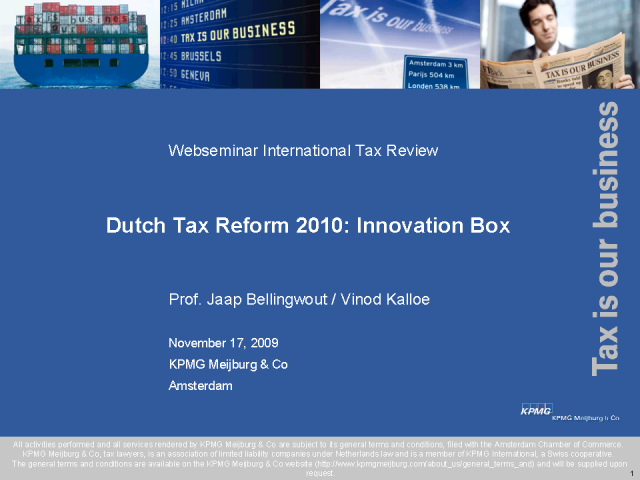 An improved "Innovations Box" will replace the Dutch Patents Box, as of January 1, 2010. This new system will result in a corporate tax rate of 5% on certain income, including gains (e.g., upon exit), from the exploitation of self-developed know-how (whether patented or non-patented). This Innovations Box will make the Netherlands highly competitive with other jurisdictions in the EU as a place to invest in innovations. Ralph Cunningham in association with KPMG Meijburg & Co. Presented by: Ralph Cunningham in association with KPMG Meijburg & Co.